The lovely pier and quay between the clock tower and the convention center is a great visit no matter what time of day it is. Sunrise and sunset are both beautiful here (especially sunset). During the day fishing boats, vendors, families out for a walk, and boatloads of tourists make it a lively hangout. In fact, this has been a favoured hangout ever since colonial times. Obviously, the people watching is fantastic.This is also the pier from where tours to the islands around Cartagena depart. 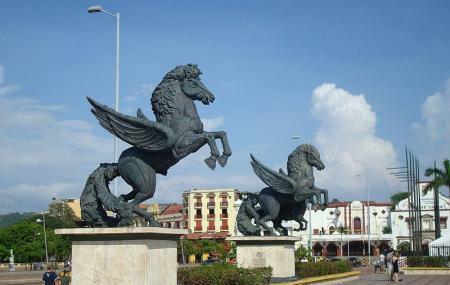 The area takes its name from the twin statues of the winged horse known as Pegasus. Do try some of the food offered by the vendors. Right across the street from the pier plaza you’ll see a cool monument to Miguel de Cervantes, the man widely regarded as the greatest writer in the history of the Spanish language, and author of the classic Don Quixote. He’s also thought of as the father of the literary novel by some. Notice the road running alongside the pier? Cross it, and you’ll see the 1911 monument of Camellón de los Mártires, also known as Walk of the Martyrs. It’s a short pedestrian pathway at right angles to the Clock Tower monument. The Italian Carrera marble structure depicting a heroic woman was sculpted by Felipe Moratilla. There are additional life-sized busts on the walk. Together, all the sculptures depict the nine martyrs shot to death here many years ago. And across the street southeast from the pier, you’ll find the increasingly dilapidated front of the once pretty building of the Teatro Colon. Once upon a time a thriving theatrical company performed inside it’s red and white walls. Today, there’s nothing much to do but click a few pictures and move on. By car or take a taxi from outside Old Town. Walk or cycle to here from inside Old Town. Majestic sculptures! You have to see them up close to enjoy the details of this beautiful family of Pegasus. You find a few deformed looking statues around these parts but these are pretty proportioned. 😝 lol?? Nice spot for photos and you can book tours in "muelle la bodeguita" is very close 5minutes walk.